The Cripple Creek Pioneers provided the lull before the storm as the Crested Butte Titans volleyball team cruised to a match win in straight sets over the Pioneers on Saturday, September 24. They will follow that with three matches in five days this week as they travel to play Gunnison and South Park and host Antonito on Thursday, September 29 at 4 p.m.
After a rough stretch of matches last weekend, coach Heather Perry turned to repetition during workouts to try to get her team in sync with their basic game plan. 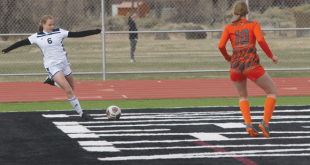 Perry knew Cripple Creek would pose little trouble for the Titans but still wanted to keep her team focused as they faced the Pioneers and prepared for the following week of matches. “I wanted them to keep their intensity up and for the most part they did,” says Perry. The Titans opened winning the first set 25-12. They let up in the second set but still won 25-21, but after Perry reminded them that the Pioneers should not be scoring that many points, the Titans refocused to win the third set 25-11 to take the match. Perry touts the Titans serving as one of the numerous reasons for their success, since they missed just eight serves over the three sets, including serving 16 aces, led by Annie Duryea and Emilya Ramsey with four aces each. Duryea led the team with kills and digs, racking up eight kills and 21 digs on the day. Elsa Watkins and Chandler tallied five kills each and libero Nicki Rehberg recorded 19 digs. “Our serving was really good and both Caroline [Chandler] and Corinna [Donavan] had long strings of serves and Corinna had a good passing day as well,” says Perry. The Titans have a non-league match against Gunnison and return to the league play when they host Antonito on Thursday, September 29 and head to South Park on Saturday, October 1. 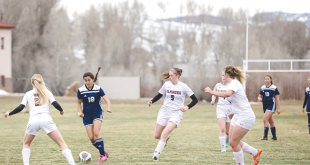 While Perry expects to come out of the three-match series with a win against Antonito, the team needs continued work on aspects of their game if they hope to compete with Gunnison and South Park. “We’re still working on reducing unforced errors and battling with the whole mental toughness thing,” says Perry.